Human travel to Mars is becoming a real possibility. 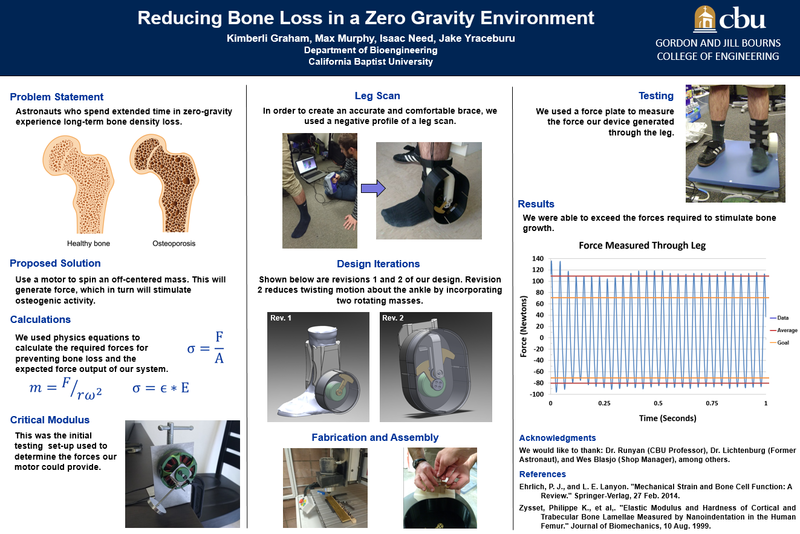 One of the barriers to space travel is the astronauts who spend extended time in a zero gravity environment experience muscle and bone density loss. We will develop a device that prevents or reduces the amount of bone and muscle loss while not interfering with daily activities and duties. 1. The product must not interfere with the user’s range of motion, as this would inhibit daily activities. To ensure this, the user must complete a series of motions without the device (baseline) and with the device. The user cannot suffer a major loss of range of motion while wearing/using the product, nor can the product break apart during the test. 2. The user must not experience injury or excessive soreness after wearing or using the product. 3. The product must not cause irritation or chafing after 3 hours of using the product. 4. The product must have the ability to be disinfected prior to use in zero g environment. 5. The maximum amount of people required to be able to use (set up/put on) the product is two persons. Ideally, the product could be used with only one person. 6. The product will either be used in many short durations or a few long durations. Short duration is defined as being used between 30 minutes to 1 hour. Long duration is defined as greater than or equal to 3 hours. a. For short duration: The amount of time required to set up/put on and then put away/take off the device should be less than or equal to ⅕ of the amount of time the product will be used or worn. b. For long duration: The amount of time required for set-up and tear-down must not exceed 30 minutes. 7. 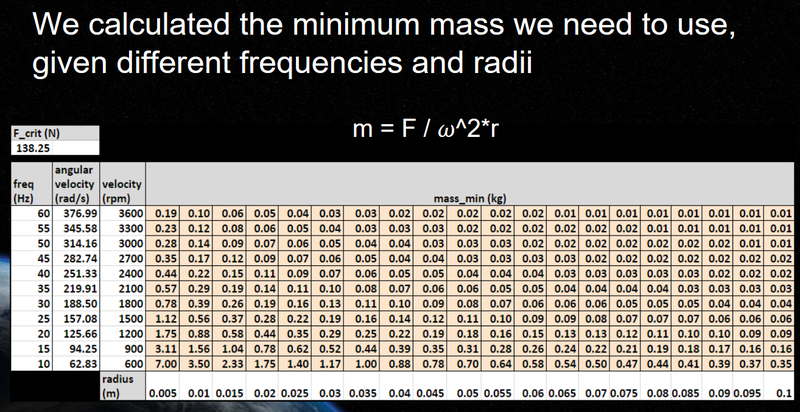 The mass of the product must be less than or equal to the user’s body mass. 8. The need for custom sizing will be determined after concept generation. 9. The product must impact major muscles and bones. 11. The product cannot cause burns and/or electric flux on user’s body. We created a mind map for our requirements for this project. We developed around 30 strategies for reducing bone loss. The team voted for the top three ideas and brainstormed the pros and cons of those strategies. The top three strategies were resistance, compression, and tension. For clarity, we defined resistance as opposition to motion about the joints, compression as providing a force inwards on the body, and tension as force applied across the length of a targeted muscle and bone group. 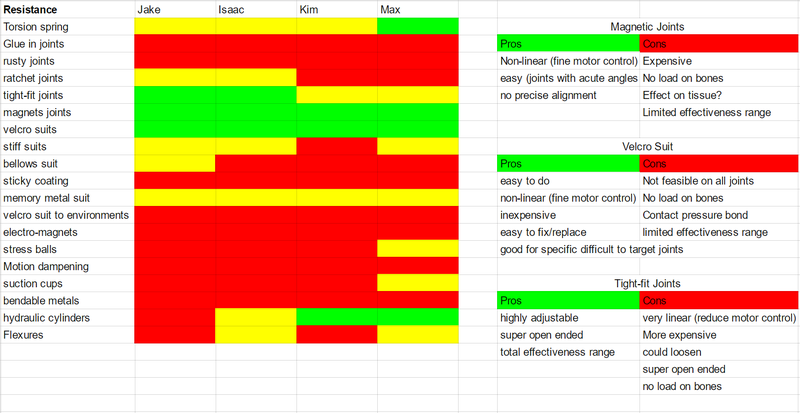 Once we had our 9 concepts, we put them into two decision matrices: one for long-term use and one for short-term use. (Previously in our project we defined “short-term” to be anywhere between 30 minutes-1 hour and “long-term” to be 3 hours or longer.) The categories for the matrices were identical, but the weights given to each category were different. For example, we decided that comfort was of lower priority for short-term use than for long-term use. We rated each category on a scale of 1-5, with 5 being the best and 1 being the worst. Based on both decision matrices, we were able to rule out five ideas automatically. The remaining four were somewhat close in score, and, due to the nature of our project, may eventually be incorporated. We believe it would be both beneficial and feasible to incorporate multiple concepts as some might be more effective on different parts of the body. Elastic bands are our highest-ranked concept due to their simplicity and predicted effectiveness, and will thus it was chosen to be our single concept. We became making prototypes based on the elastic bands as well as the constant force springs to test out our idea. We decided on using braces since they are made to be comfortable for long periods of wear. An additional benefit of using braces is that many braces have Velcro fasteners, meaning that they can be put on and taken off quickly and easily. Any sort of “guide loop” could then be mounted to these surfaces to connect the elastic bands. Below is an example of what we are hoping to use. We researched and found three different on body harness depends what budget we were given. Two main reasons for why we didn’t proceed with this model. At this point of the project we felt to dive deeper into research about the amount of load needed to sustain healthy bone. It was very hard finding data for in vivo bones as most of the data is done with dry bones. I was able to find research about bone growth initiated by dynamic, cyclical mechanical loading in either two methods: low-frequency, large intensity or high-frequency, small intensity. We choose the latter strategy and P. J. Ehrlich and L. E. Lanyon state in “Mechanical Strain and Bone Cell Function: A Review” that high frequency is greater than “30Hz” and low intensity is less than “10 microstrains.” We had to create a device that would apply a cyclically compressive force to stimulate bone growth while still allowing the astronauts to perform necessary tasks. In order to determine how many newtons were in 10 mircostrains, we decided to also look at the physical and mechanical properties of bone, such as the cross-sectional area, modulus of elasticity, etc. 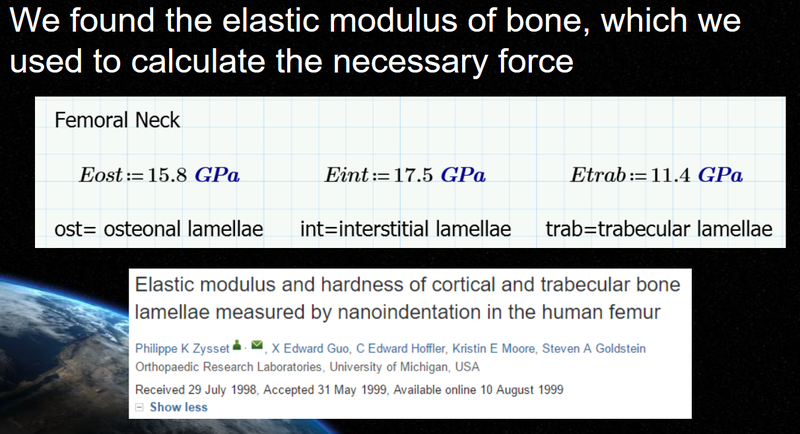 We found the elastic modulus of the bone which we used to calculate the force. To determine the area we found a CT scan of a femur and took a “slice” of the femur neck in Solidworks. It was found that the cross-sectional area was within the size range we found reported in research papers and internet searches. 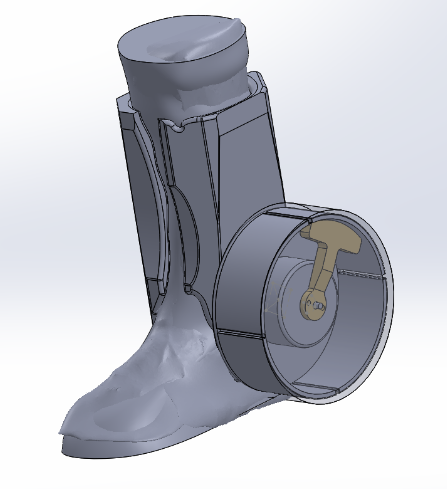 After researching and consulting former astronauts, we realized that our design would not be adequate for targeting the legs. This also made us realize that we couldn’t use elastic bands as our method since they are a passive method not an active method. 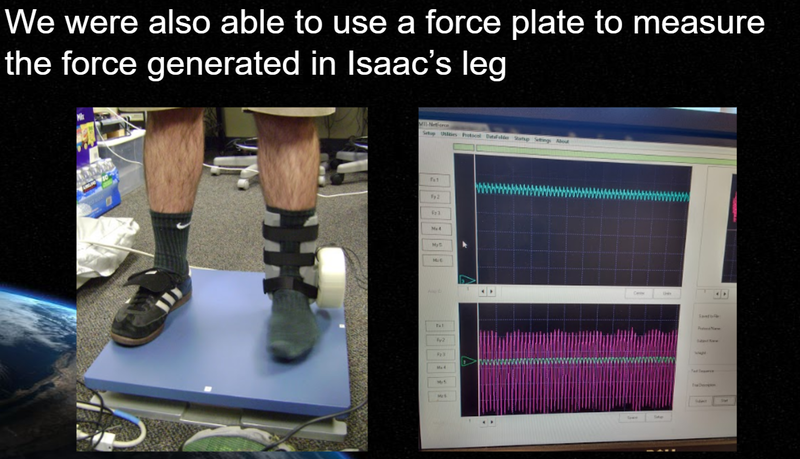 We had two major strategies: overpowering (where the device or suit moves the leg) and frequency-based (where we would be trying to achieve a minimum strain delivered at a specified frequency). Concepts were generated under these two main strategies and can be seen in the pictures below. 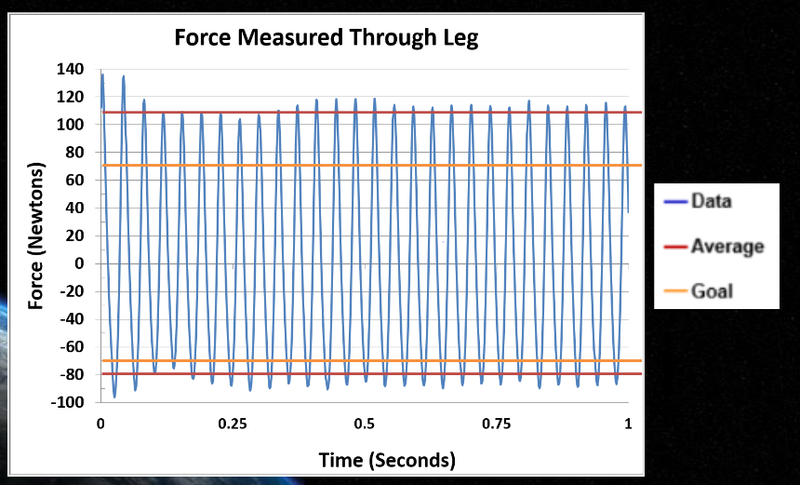 We chose to go with the concept of spinning an off center mass to create the force in the leg. Clustering the elements in the schematics allowed for a better understanding of the project as well as fundamental and incidental interactions between elements were identified. We were worried about energy created by the spinning weight being absorbed by the human tissue and cartilage in the body. We made sure that we weren’t generating the same force of causing a bone fracture. Bone fracture happen at the 1000 mircostrain level where we were aiming for about 10 mircostrains. Once we determined the force needed we calculated the speed and weight of the spinning system. To verify our calculations we performed initial testing with a simple mockup and recorded the rpm’s with a tachometer. This also opened our eyes to notice how fast and how heavy we planned on running the system at. This was our initial design for the new system. It features a brass weight, single quadcopter motor ( chosen for its torque rating and small size), two 3D printed custom ankle braces (70% infill of PLA filament), a 3D printed case to prevent anything coming into contact with the spinning weight. 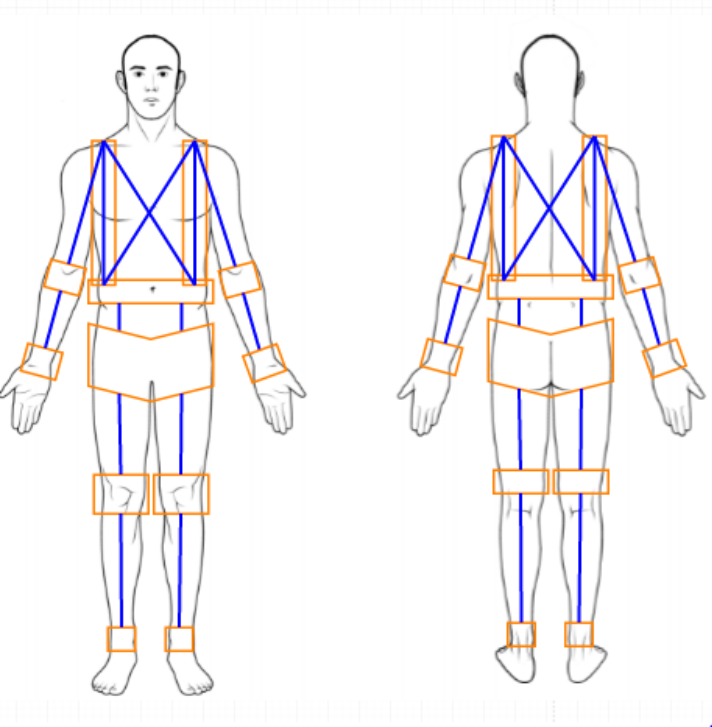 The “brace” actually consists of two pieces, which are designed to be worn over a sock and are held in place via Velcro straps. The piece that fits on the outside of the ankle (the lateral side) has a slot that holds a small insert made out of steel. 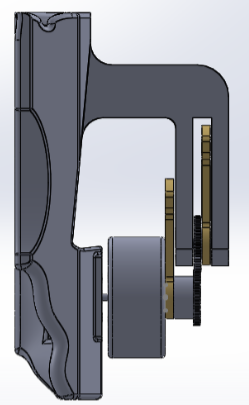 The motor is thus able to be placed on the external side of the brace and screwed into the insert, rather than the brace itself. This provides additional strength and durability to the setup. Using a force plate, we were able to generate this data. 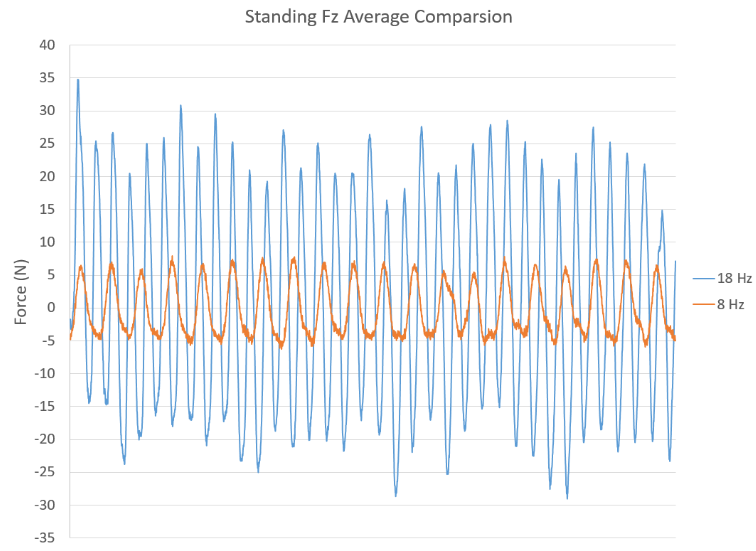 The 8 Hz’s (480 RPM) average peak-to- peak force is roughly 10 N and the 18 Hz’s (1080 RPM) average peak-to- peak force is roughly 50 N.
The spinning weight created forces in all ranges of motion so there was a great deal of axially rotation around the leg. If there too much axially rotation, the fear was that the brace and the motor would be detached from the leg. The theory behind the design is that spinning both weights simultaneously opposite of each other will cancel out “side-to- side” force that is causing the system to wiggle. This should not affect the “up and down” force, however, that is being transmitted axially along the wearer’s leg. 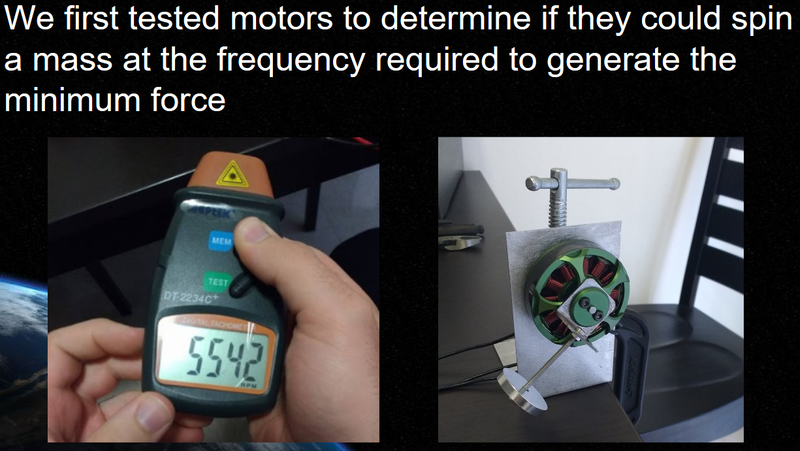 Running this motor on the force plate we obtained this data. The goal of an average peak-to-peak force of 140 N to trigger bone growth was reached, we were about to run 35 Hz (2100 RPM’s) to achieve an average peak-to-peak force of 190 N.
lid. The lid for the casing slides on and off via notched grooves in the sides of the container. Here is the arduino code used for this project. The servo Arduino library was used to run the motor at specific speeds. 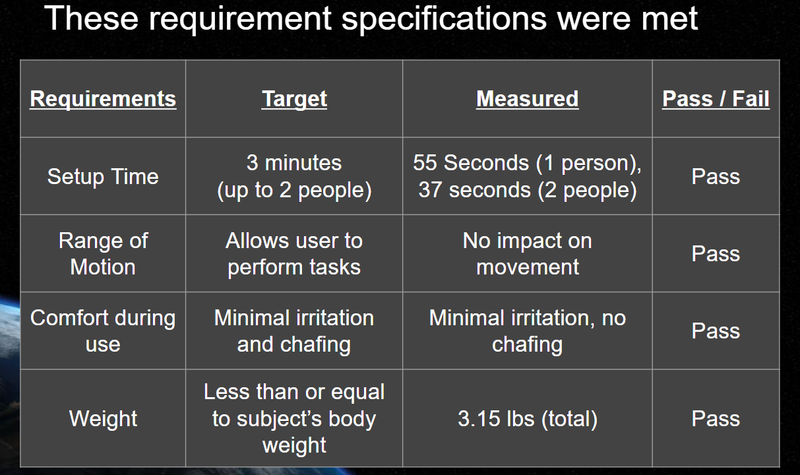 As the requirements state above, here is a slide that summarizes our results from the requirements testing. I am happy with how the project turned out, it was interesting to see where the brainstorming and the time spent in creating this project would take us. I had the absolute greatest pleasure working with the best team members, Kimberli Graham, Jake Yraceburu, and Isaac Need.